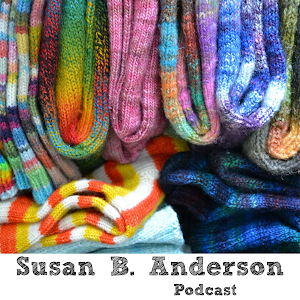 Susan B. Anderson: New Book, New Classes! 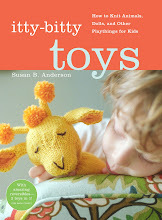 Click here to see the book trailer video for Topsy-Turvy Inside-Out Knit Toys! Don't miss this 1-minute video, it's adorable! 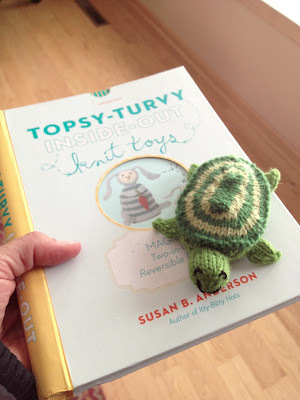 Click here to pre-order Topsy-Turvy Inside-Out! For the moment I want to focus on the turtle sitting on the cover. 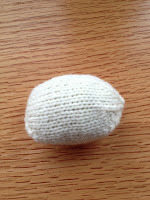 The turtle is one of my reversible toys and it does turn into an egg or vice versa. 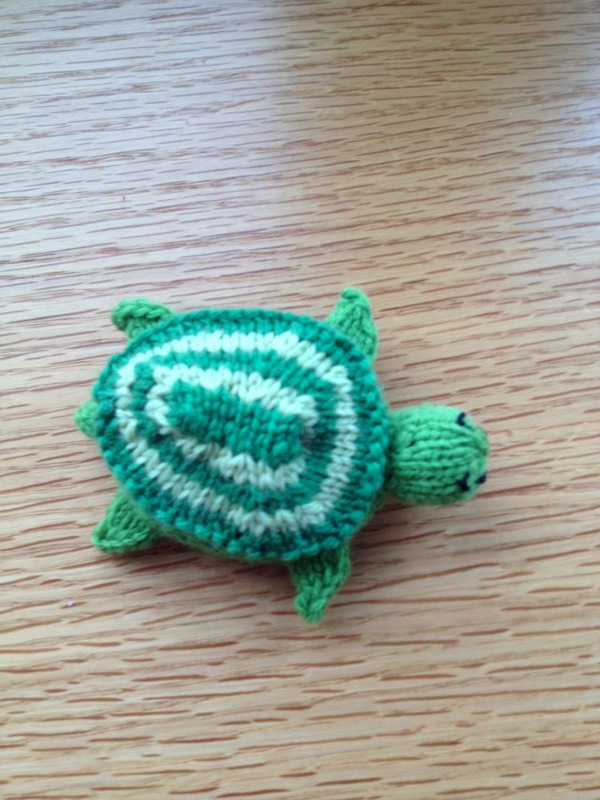 The pattern for the Egg to Turtle toy is not in the book. This pattern is a BONUS pattern, a separate promotional free pattern that I get to share with people attending my classes and events in the months to come. I am really excited about being able to share something in addition to the book at my upcoming signings, meet and greets and classes. I know the belly shot is not all that flattering for the turtle, my apologies dear turtle, but I want to show you the opening on the underside where you turn the egg inside out to get the turtle. For size it rests in the palm of your hand. 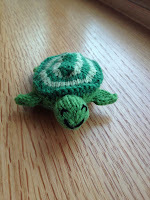 The entire turtle is knit in one piece - no seaming involved! 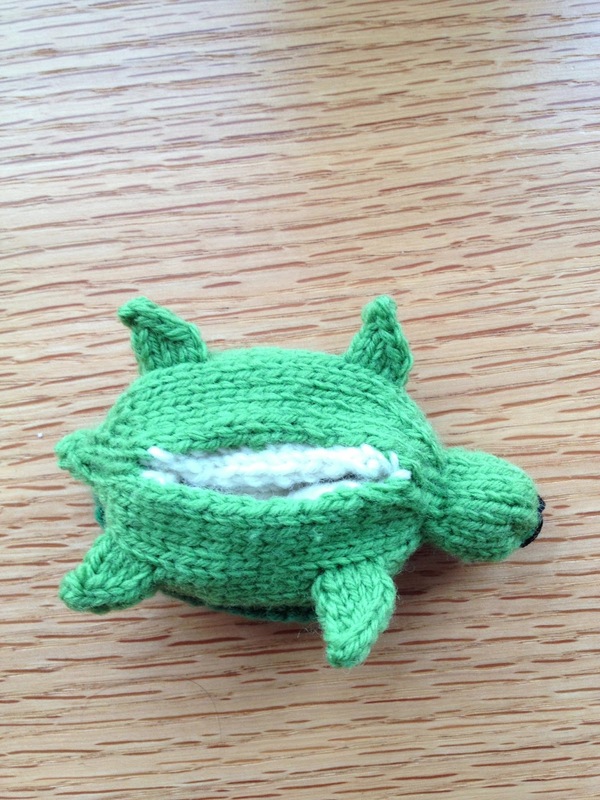 The only seam is a simple whipstitch to attach the egg to the turtle around that tiny opening. It's super easy. Anyway, my publisher is making slick pattern cards for me to share with you. 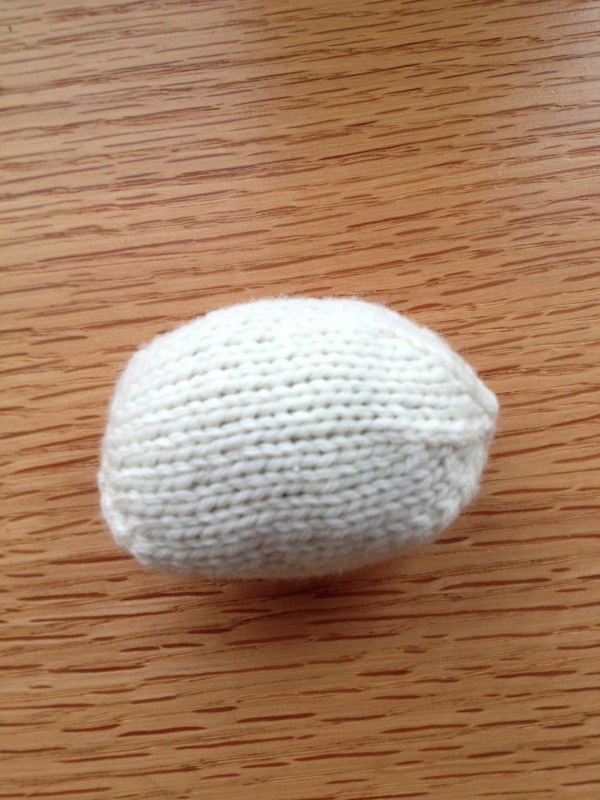 I have made a couple more Egg to Turtle toys, one in gray, white and blue and another in pink, purple and blush just for fun. I'll post more photos later. It's plain old adorable. I hope to see any of you who can make it out to see me at a few places I am visiting across the country, really from side to side. March 9th - Madison Knitters Guild Knit-In! 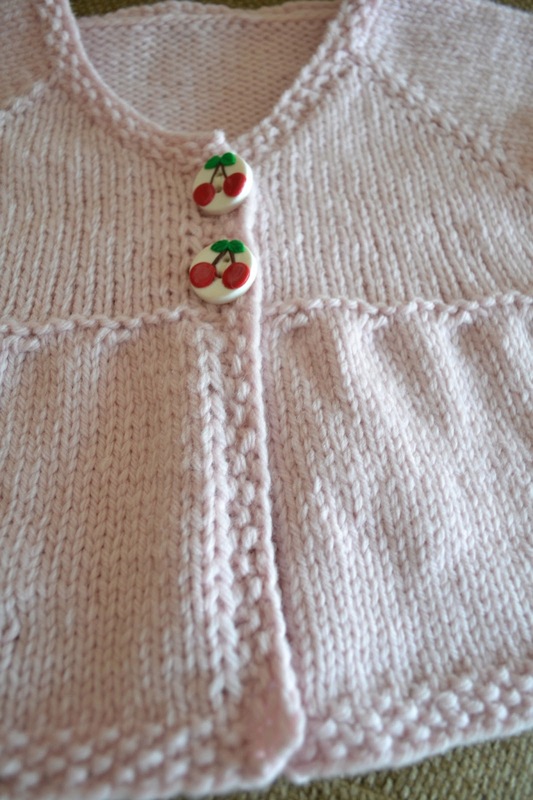 I am teaching a Top-Down Baby Cardigan class filled with options (hood, fronts, sleeves, body shapes) and instruction on how to design your own cardigan. 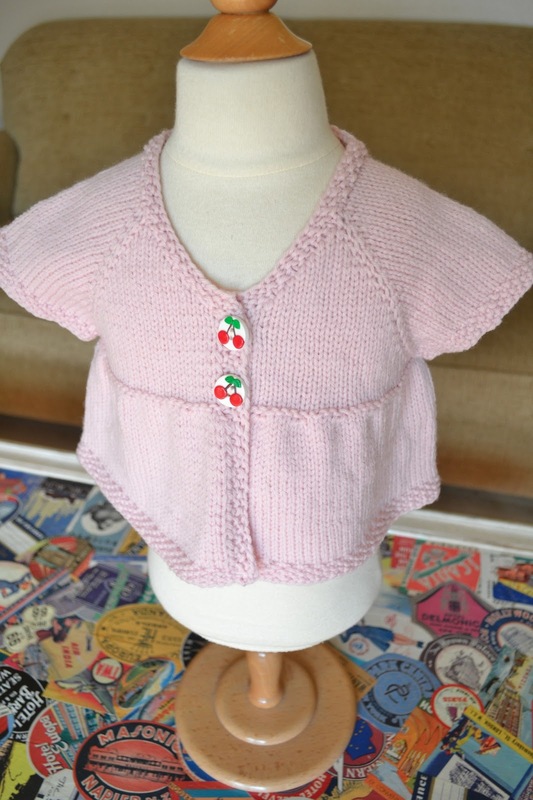 This class includes baby cardigan patterns with loads of options (newborn to 2 years in size), a tiny ornament-size sweater, and a doll or bear sized cardigan. Lots of options, lots of fun! The other class I am teaching at the Madison Knit In is the String-a-Long Toy class. This class packs in tons of toy-making techniques, and patterns for seamless frogs, mice or monkeys, plus a bonus pattern. 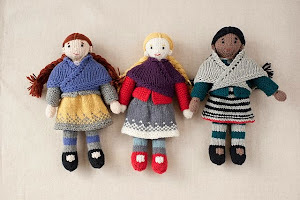 These toys are knit entirely in one piece - no seaming involved - from the bottom up! 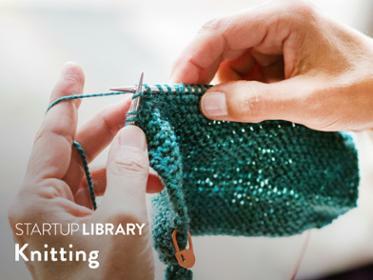 The Madison Knit In has a sign-up open to members first and then the classes are open to the public! Elsbeth Lavold is speaking and teaching, and Amy Herzog is also teaching amongst many other fine instructors. 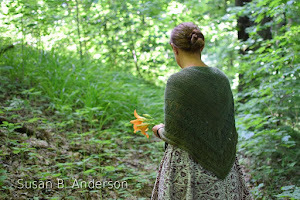 Click here for more information on the Madison Knit In and I hope to see you there! 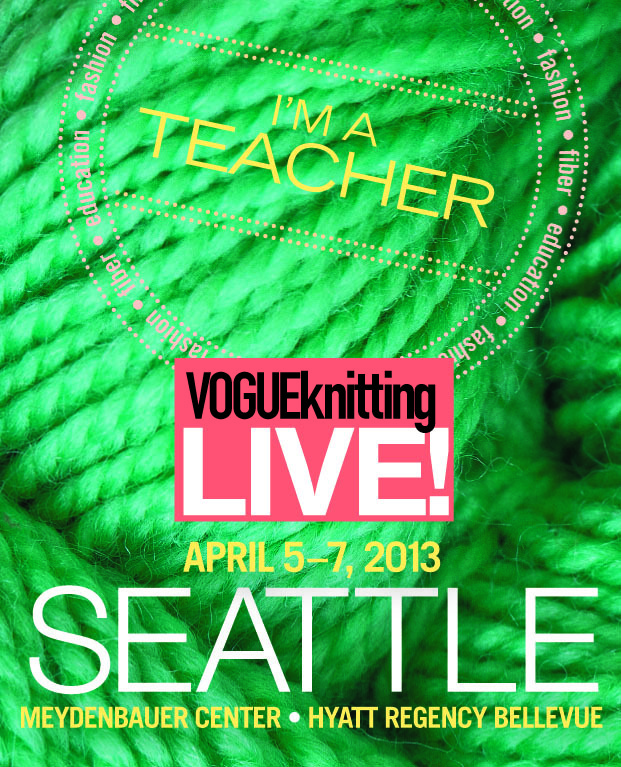 April 5-7th - Vogue Knitting Live in Seattle, April 5-7th! Plus a separate Seattle yarn shop event to be announced very soon! I can't wait to head to Bellevue/Seattle coming up shortly here! I will be teaching three days of classes starting on Friday, Apr. 5th straight through Sunday, April 7th. These classes include String-a-Long Toys class above but also some new classes I'm working on. One of the new classes is my Fair Isle Hat Class. We are going to learn how to knit colorwork using two colors and two hands (at the same time), Latvian Braids, how to work long carries of colors, reading a simple chart, and corrugated ribbing all while making a wonderful sampler hat. This class is packed full of technique, beginners are welcome, be prepared to work hard and have fun! Here are some photos of the hat patterns (you will get lots of choices to design your own version in your own selected size, baby through adult) that will be provided in the class. 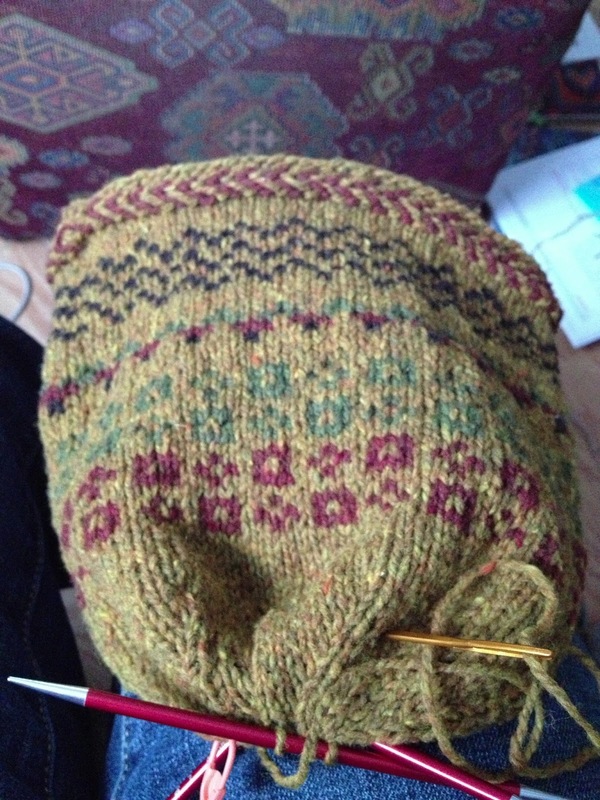 The Fair Isle Hat classes in Seattle have just had more spots added. That is so exciting! 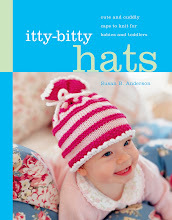 Click here to see a 6-second video of the finished hat shown above! 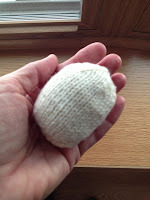 Another new class I am teaching at VK Live in Seattle is my seamless all in one-piece Sock Bunny Class. This is another loaded toy technique class. 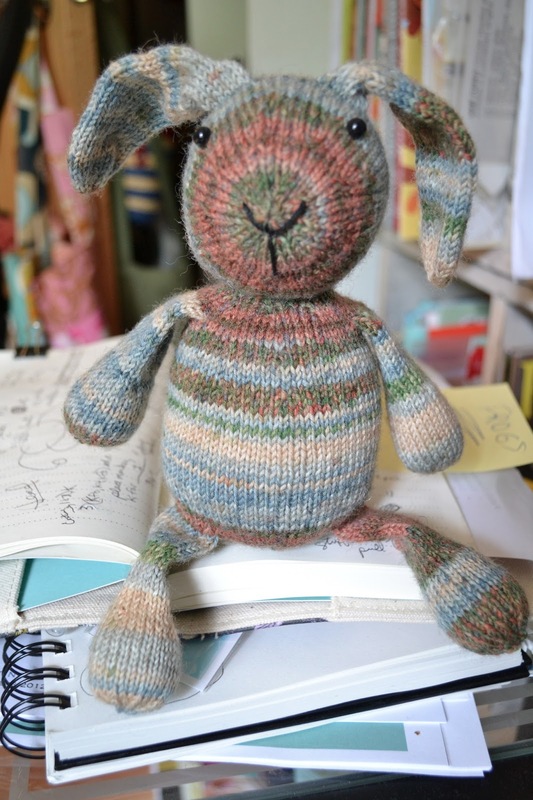 Grab that languishing ball of sock yarn, striping or solid, or leftovers, and head to this class to create this adorable seamless sock yarn bunny. That's right, it is knit entirely in one-piece. 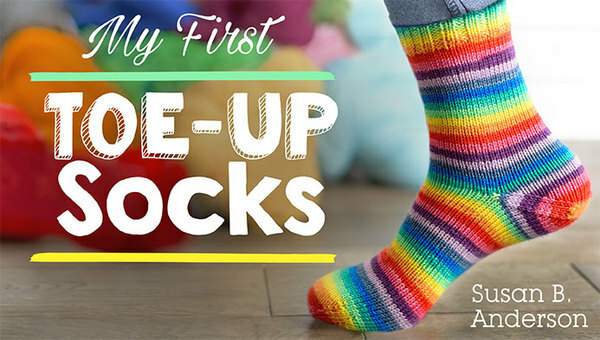 We will be learning about after-thought arms, legs and ears, face embroidery, stuffing techniques, picking up and knitting onto your toy and more. I am currently working on a smaller version pattern to hand out in class as well for an additional option during class. 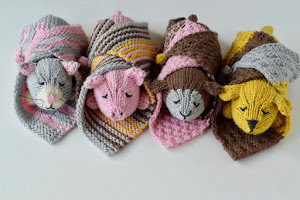 I am providing the companion sock bunny hat pattern for the students, too. The bunny is one of my favorite toy designs ever and it provides such a great teaching tool. I am also teaching a Build-a-Toy Class in Seattle that is new. I am working away on class samples and patterns and will share photos soon. In this class you will be given patterns for different body shapes, head shapes, ears, limbs and tails to create your own one-of-a-kind toy. Along the way the students will be learning all kinds of toy-making techniques and tips all while designing their own knit toys. I am having so much fun creating this class material. I can't wait for this event! These VK Live events are like nothing else. I hope to see, teach and meet as many of you as possible. This is my first trip to Seattle so I am hoping it's a good one. My new book, Topsy-Turvy Inside-Out is being released April 9th, 2013. I will have the bonus pattern available at all of these events so come and see me if you get a chance. 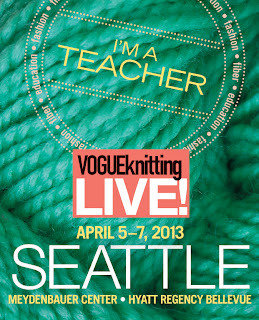 Click here to go to the Vogue Knitting Live website to find out more! That's enough information for today. I have so much more in the works. Over the next months I will be traveling to Maryland, Nashville, New Brunswick Canada, Ft. Collins Colorado (event at the Loopy Ewe store and the Spring Fling! ), Alexandria Virginia, Columbus Ohio, Illinois, Minneapolis.... and more. I will talk about it in pieces because it is too much for one post. The free bonus pattern Egg to Turtle will be available at all of these upcoming events! Please let me know if you are coming. I get so excited to teach as it is one of the best parts of my job. Congratulations on your new book, I'll be ordering it for sure! I have two of your books already and love the patterns and ideas that they contain. 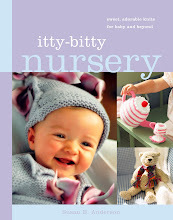 I don't have reason to knit baby clothes so have not purchased the baby books. But have made several of the toys for friends and their children. I wish I could attend a class, but due to health issue I am unable to travel at this time. They are talking heart surgery and had already decided on a total hip replacement that will now have to be postponed. I am too young for this, but stress and hard work has taken it's toll on my body. Knitting is my relief and my joy though I am just an advanced beginner if I take my time I can do the things I really love. Thank you for all that you do, love your blog and get such inspiration from your posts and patterns! Love the turtle,hope it is in the book, my Mom (85) has a turtle collection and she will love this! I am very excited about your new book. I always love to see your work and your creativity unfolding - literally speaking for the new book!!! Will there be a pattern for the string-a-long toys? Too far to travel from Norway!!! Good luck with the new book!! It is on my list!! So much awesomeness in one position. 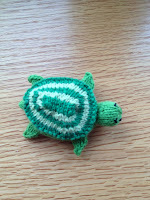 I was wondering whether the reversible turtle pattern will be available for download at some point? He is really cute! 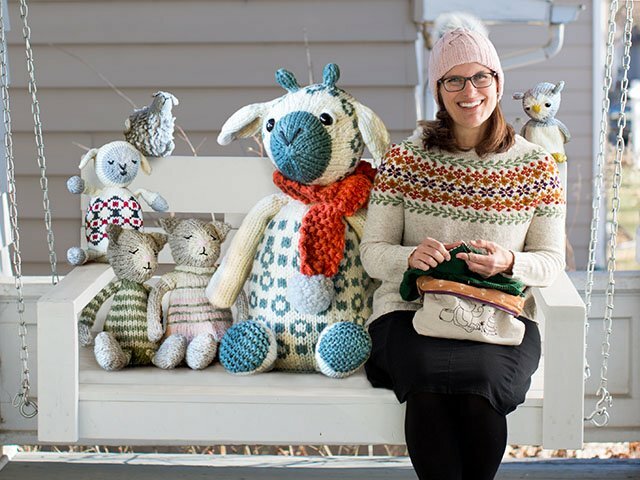 Susan, it goes without saying that your knitting is beyond wonderful and amazing - and all of these are proof of that! 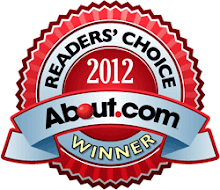 You are definitely one busy lady - Congratulations on your wonderful success! Hoping to meet you when you come to Maryland! I was very excited to see it on your list of places you will be visiting. 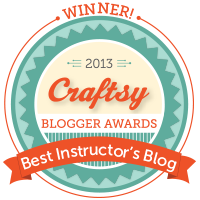 You are a whirlwind of amazing knitting activity! Congratulations on getting the print copy of your new book in hand. It is beautiful! 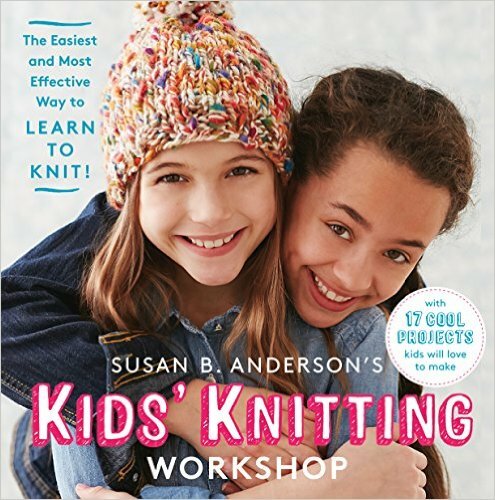 What knitter would not want that book? Those baby sweaters are adorable too. I am waiting anxiously for my preordered copy:). As always, your books make me smile. Please think about coming to Phienix sometime! I will talk to any LYS I need to. Have fun with your classes and travel. Wow, what a busy lady you are! I really like to Sock Bunny. Will there be a pattern available for it? I will be preordering your new book!! Also excited that you will be coming to Maryland. Can you give more details about this visit? Colleen - I'll talk in more detail about the other events as they get a little closer, Maryland included. Marianne - I wish you all the good luck in the world with your upcoming surgery. I am glad knitting can offer you relief. I know how that goes. The book looks amazing but what about those of us who NEED to make that turtle but can't come to the classes? Like Cora asked, will you make that downloadable at some point? I'm going to the Knit In in Madison, but I wasn't able to sign up for one of your classes. Is there any chance you might have extra copies of the turtle/egg? Can not wait to see for knit east !!! It's going to be a blast !!! The book looks so good !! Can not wait until Knit East ot going to be a blast. Ah, I hope the Maryland or Virginia events will fit my schedule! Will you be in the tri-state area any time soon? 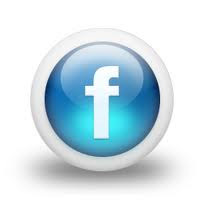 I live in Fairfield County, CT, and I would love to attend one of your workshops. I love the trailer for your new book, and I am going to ask for it for an anniversary present from my husband. What about us folks that want the turtle / egg pattern and aren't close to the tour events you are attending? This isn't fair! LOL! I love these. The turtle, the classes, everything! Somehow I doubt you'll ever be teaching in Kansas but if you are I'll be there! Your new books looks amazing! Love the turtle pattern! I have pre-ordered your book from Amazon when your first talked about it. They told me the date was pushed out a bit but that is okay, any book you write is worth waiting for! Since I am in Canada, how would I be able to get the turtle pattern, looks like it can't be an option of attending classes :(. I am hoping the sweater comes out soon too, for all of us to create, either in video teaching or the book. 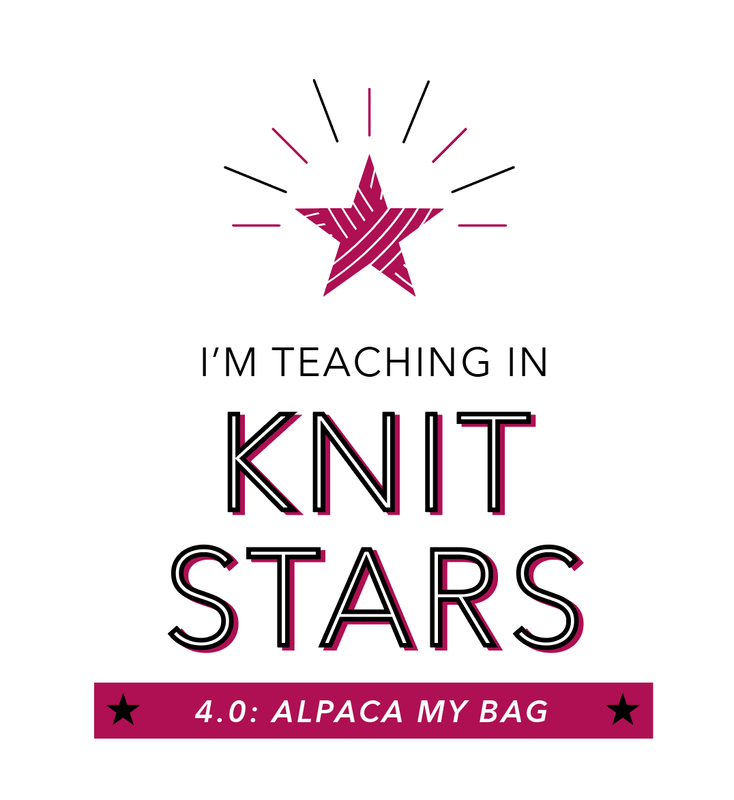 I will be at the sweater class for the MKG Knit-In. Excited to get a copy of the cute turtle - are turtles ok for Easter? What are the Brand of DPN's you use? The ones pictured in the Intarsa Hat picture. Will you be releasing the sweater pattern you are using in your class? I love this book so much! Congratulations with it. It's on my birthday list. Hope to get it from someone! But... I read something above here about a free sampler of the egg and turtoise. Is it also available for people overseas? I love the pattern. 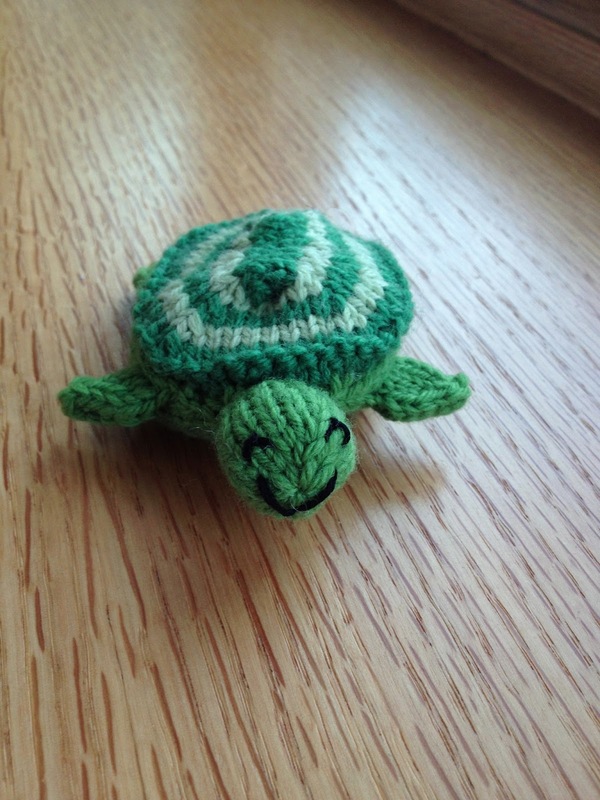 The turtoise is só cute!! I was really excited to get both books. But I ordered from Amazon before I realized there was a hoop to jump through to get the egg to turtle pattern. At any point, will that pattern be made available to people with the books, but who can't get to the workshops? cori1 - yes the egg to turtle pattern is going to be released as a free pattern through Knitting Daily TV in January 2014. 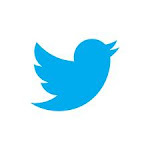 I will blog about it when it becomes available. That's great! I was hoping to make a set of the 4 for my grandkids. It'd be nice to have them for Easter! Thanks for ALL your patterns!